Dark Horse Pictures, a brilliant study in language and new poetic form. 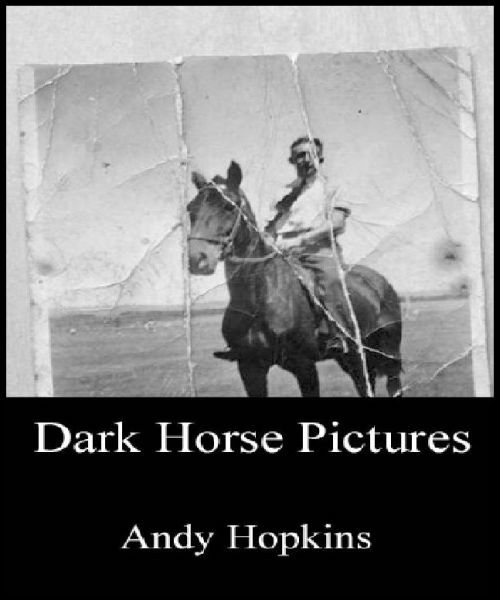 Dark Horse Pictures is the first Poetry Chapbook by Andy Hopkins a Poet/Teacher/Musician active on the culture scene of Carlisle, U.K. Originally the text was published by Selkirk Lapwing Press. This writer was especially taken by the two experimental poems, Unspectacular Station Revelation and Allonby Tidal Marks. These 2 poems are considered at once brilliant and an experiment in form. Allonby Tidal Marks plays with language and presentation as the words are squiggly lines going down the page in 4 columns. When the lines are read, the poem unfolds as ruminations of waves on a beach, disjointed free association as a pictorial wave. Unspectacular Station Revelation is 3 repeated paragraphs, the last one listing citations for words. As you look up the citations the story of a missed date with a girlfriend unfolds, captivating the imagination. evil is a study in the unconscious raising questions. The last four poems Parakalo, on a Kefallonian Beach, Unfrogs/Prefrogs, New Years’ Eve and What God Said to Me on Cross Fell seem like double entendre, a dance perhaps with someone considering a love affair, a series I call “a prayer to a goddess”, as the gentleman makes excuses for his absence and seems to be caught in a crux of dilemma that appears at once impossible and yet is not. In “Parakalo, on a Kefallonian Beach” - “I did not want to come./You could take me over a rock like a slave. Or/I could pull you out of the water/onto the same hot rock, like a lava goddess, scintillating/sacrificially real.” And further in “What God Said to Me on Cross Fell” – “And I did stop to listen, whilst out walking, by the cross/against the sky./And the fell was empty. And I did try to hear. Even the/radar turned to hear.” As if some struggle with conscience and God, the tortured ruminations of the Poet looks to the universe for answers, this Writer says “to thine own heart be true”. A beautiful poetic treatise with brilliant use of language and innovations of the poetic form, Dark Horse Pictures by Andy Hopkins. Available at OBOOKO and Philistine Press.